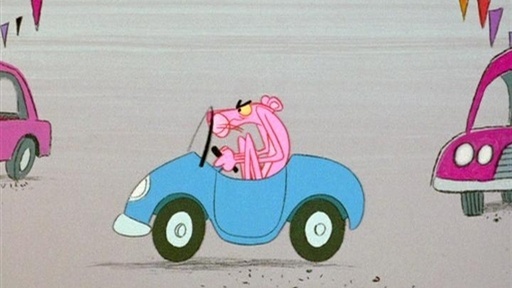 You are currently browsing the category archive for the ‘Pink Panther films’ category. 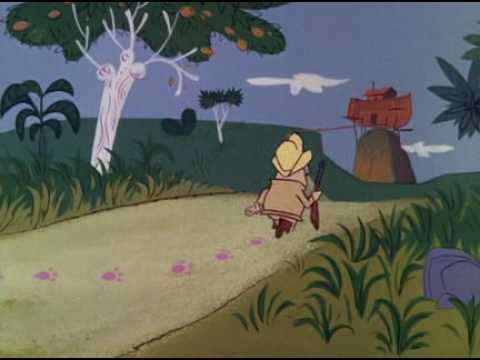 After a long evening of watching television, a tired Pink Panther tries to sleep, but he’s hindered by a small but annoying mosquito. 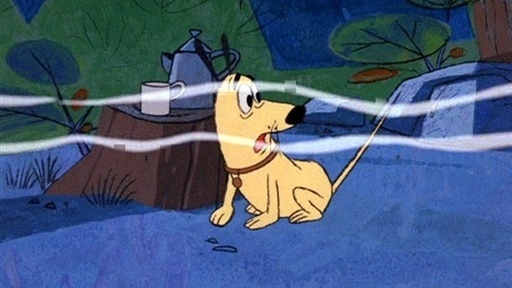 ‘The Pink Tail Fly’ is one of the better entries in the Pink Panther series, and a worthy addition to the sleeplessness cartoon canon, being able to compete with cartoons like the Woody Woodpecker cartoon ‘Coo-Coo Bird’ and the Donald Duck cartoon ‘Sleepy Time Donald’ (both from 1947). It contains several good gags, which build up to a great finale. 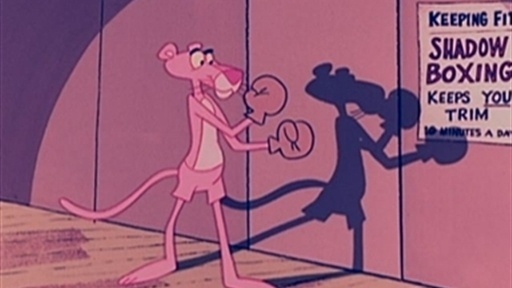 The highlight may be the gag in which the Pink Panther tries to kill the mosquito using karate. 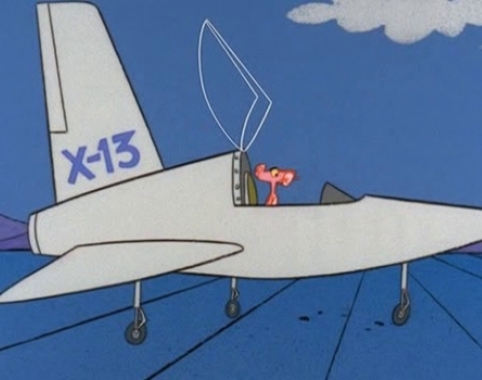 ‘The Pink Tail Fly’ was the last Pink Panther film to be directed by Friz Freleng himself. In ‘Pink Ice’, the Pink Panther is reunited with what he was named after: diamonds. 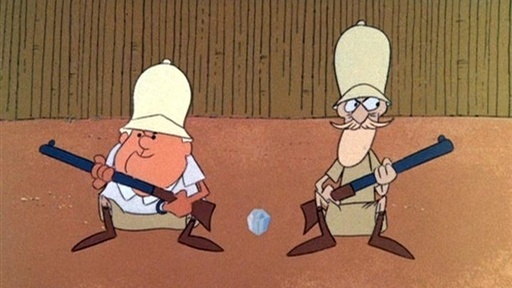 In this film the Pink Panther owns a diamond mine, which is stolen by two colonial Englishmen. 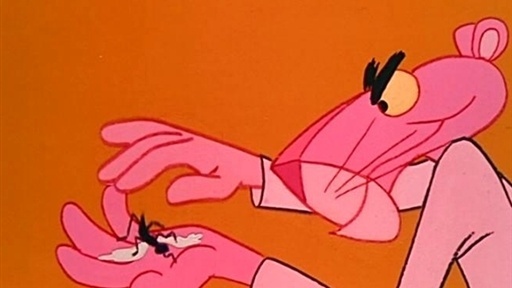 ‘Pink Ice’ is a perfect example of how the DePatie-Freleng Studios struggled to hit the right mark in the early Pink Panther films. 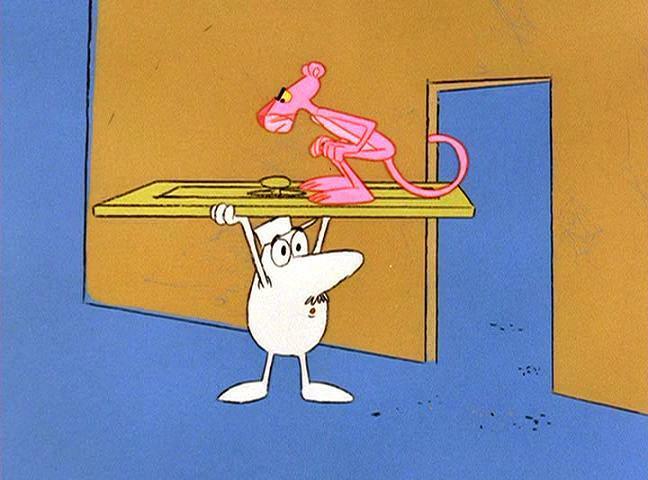 In ‘Pink Ice’ the Pink Panther behaves particularly unfamiliar. Not only does he wear a dressing-gown throughout the picture, but he talks, and a lot, too. As was to be expected, it’s not a success. 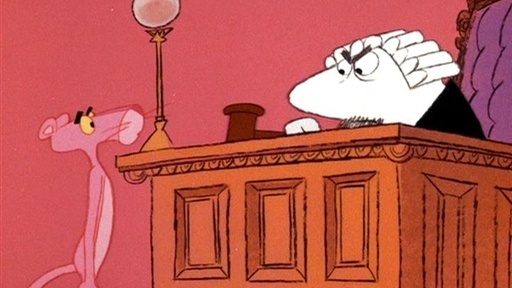 The film is vaguely reminiscent of some of Friz Freleng’s Bugs Bunny-Yosemite Sam outings, but its abundant use of dialogue is annoying, resulting in a weak entry in the series. 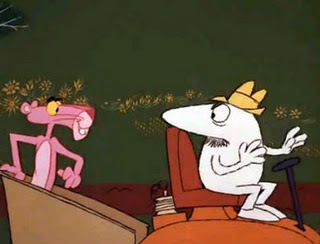 Luckily, this experiment with a talking Pink Panther was not to be repeated. In ‘Sink Pink’ a Texan hunter builds an ark to lure the animals of the savannah into it. 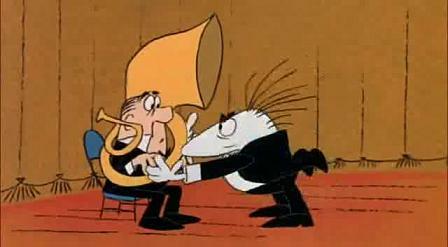 Sink Pink is the Pink Panther’s fifth film and the first to use dialogue. Unfortunately it’s a bad addition. The Texan hunter’s constant jabbering distracts from the pantomime humor. In the end even the Pink Panther himself speaks, which is even a worse idea. 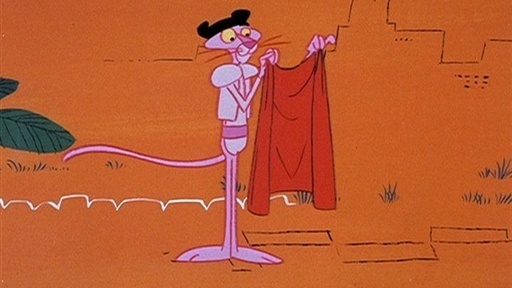 Nevertheless, ‘Sink Pink’ is noteworthy because it’s also the first film in which the Pink Panther shows his unique walk. 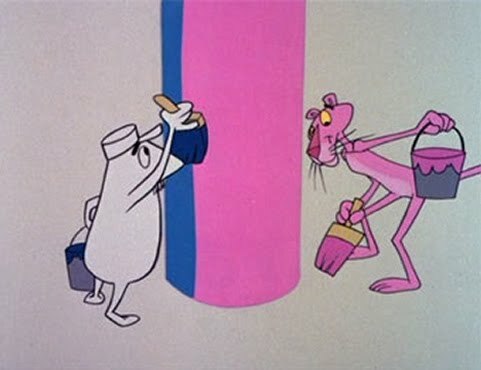 ‘Dial “P” for Pink’, the Pink Panther’s fourth film, has nothing to do with calling on a phone. 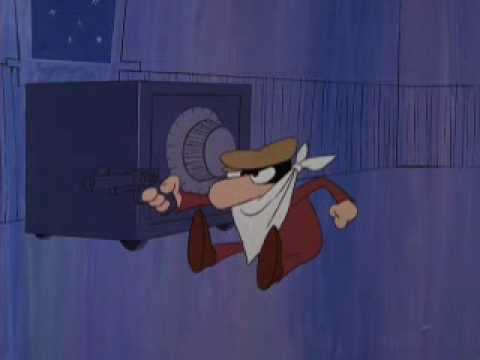 Instead, we see a burglar trying to crack a safe. Oddly enough, this safe is in habited by the Pink Panther. This extraordinary, but very simple idea is worked out perfectly into a tight plot (by Bob Kurtz), which matches that of ‘The Pink Phink‘ (1964). ‘Dial “P” For Pink’ is the first Pink Panther film to use music from the Pink Panther live action film ‘A shot in the dark’ (1964). Besides the familiar Pink Panther theme, this would become the background music for practically every Pink Panther short to come.